Fore, bella! 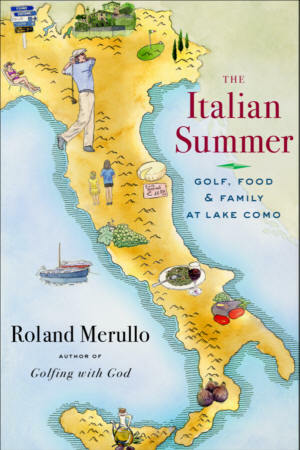 From the author of the critically acclaimed Golfing with God comes a charming narrative of hole-in-one trip through Italy—a glorious summer of golfing, eating, and learning how to slow down and enjoy life. The best-selling author of Golfing with God and the Revere Beach trilogy combines two of his greatest passions—travel and golf—in this humorous and poignant look at Mediterranean life. In the summer of 2007, Roland Merullo was feeling a little burnt out by the frantic pace of life in the United States and decided to rent an Italian villa near the shore of Lake Como in a small town called Mezzegra. He arrived in Italy with his wife and two young daughters determined to relax, slow down, and enjoy life in the manner of their Italian hosts. Merullo also resolved to play a little golf and frequented the many gorgeous golf courses that populate the countryside. With his customary wit, he shares the entertaining account of his trip through Italy in the wonderful Golfing in Italy. Composed of tales from some of Italy’s finest golf courses, descriptions of the meals Merullo and his family enjoyed, and portraits of the various eccentrics they met along the way, Golfing in Italy brings to life the myriad joys of Italian life in a way that all lovers of food, wine, and the proverbial “good walk spoiled” will savor. The perfect Father’s Day gift for golf enthusiasts and armchair travelers, Golfing in Italy pays homage to a slower, richer way of life—one filled with good food, pleasant company, and beautiful surroundings.